Ruling Liberal Democratic Party leader and Japan's Prime Minister Shinzo Abe, left, speaks as Party of Hope leader Yuriko Koike, listens during the party leaders' debate for the Oct. 22 lower house election in Tokyo, Oct. 8, 2017. The leader of Japan’s new conservative opposition party this week questioned the stability of U.S. President Donald Trump, which could make the often polarizing American president a divisive issue in the snap parliamentary election to be held on October 22. Seeking to take advantage of rising public support for his hardline response to continued North Korean nuclear and missile tests, conservative Japanese Prime Minster Shinzo Abe recently dissolved parliament and called for an early election in an attempt to extend his hold on power to 2020. In campaign pamphlets, his Liberal Democratic Party (LDP) prominently highlights Abe’s personal friendship with Trump as a political asset that will “strengthen the U.S.-Japan alliance” to protect the country against the North Korean threat. 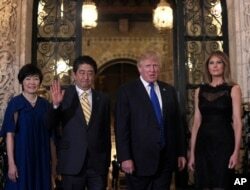 FILE - President Donald Trump and first lady Melania Trump stop to pose for a photo with Japanese Prime Minister Shinzo Abe, second from left, and his wife Akie Abe, left, before they have dinner at Mar-a-Lago in Palm Beach, Fla., Feb. 2017. “I think the emphasis now is [to] try to make sure that the U.S. deterrence is more something that Japan could feel assured about, and to make sure that the U.S. is onboard to make that happen,” said Takako Hikotani, a professor of Japanese politics at Columbia University, during a recent Council On Foreign Relations event in New York. Abe has shown unwavering support for the Trump administration’s emphasis on pressuring the Kim Jong Un government to halt its nuclear program through increasingly crippling economic sanctions and the possible use of military force. And like Trump, the Japanese leader is doubtful that a verifiable negotiated settlement with Pyongyang can be reached, until and unless the leadership in Pyongyang faces an existential choice between survival and denuclearization. “What is needed is not dialogue, but pressure,” Abe said during his address to the United Nations in September. A commercial plane flies over the USS Ronald Reagan aircraft carrier in Hong Kong, Monday, Oct. 2, 2017. In a joint show of force, the U.S. Navy aircraft carrier, the Ronald Reagan, is conducting drills with a Japanese warship in waters around Okinawa southwest of the Korean peninsula, Japan's military said on Wednesday. Abe may have anticipated an easy election contest against the Democratic Party, the main liberal opposition that has opposed his government’s efforts to strengthen the Japanese military by altering the country’s pacifist constitution. But the emergence of a new conservative party, called Kibo no To (Party of Hope) led by popular Tokyo Governor Yuriko Koike, a former Minster of Defense, is offering a strong national security alternative. Tokyo Governor Yuriko Koike, head of Japan's Party of Hope, attends a news conference to unveil its election campaign pledges, Oct. 6, 2017. Koike said she is “not yet sure whether the Trump administration is stable,” and given the “extremely dynamic personnel changes” that have occurred within the White House she wants to “look carefully to see what kind of administration this will be." Koike is also concerned that Trump, who sees himself as a deal maker, might agree to reduce U.S. support for Japan in the future, to get Beijing’s cooperation on North Korea, trade and other U.S. national security priorities. Even though public support for the U.S. alliance may have increased in the face of the North Korean threat, Trump remains a polarizing figure for many Japanese. “A strong alliance with [the] United States seems to be sort of reassuring for obviously some people, but on the other hand this is not an ordinary president of the United States,” said Koichi Nakano, a political science professor with Sophia University in Tokyo. It is unclear whether Koike’s attempt to differentiate herself from Abe on national security will resonate with the electorate. Both also support altering Article 9 of the constitution that prohibits Japan from going to war to settle international disputes, and they both argue the Japanese military needs more latitude to counter increasing threats from North Korea and China. 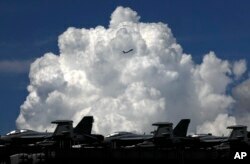 Opponents say it could entangle Japan in international conflicts, most likely in support of its U.S. military ally. A new poll from the Yomiuri newspaper in Japan indicates 32 percent electorate support for Abe’s LDP and only 13 percent for Koike’s Party Of Hope, a drop of six points since September. The formation of a new left-leaning Constitutional Democratic Party of Japan may also be splitting off support for Koike’s party.